The issue came up as part of a regularly-scheduled neighborhood meeting between officers and residents. 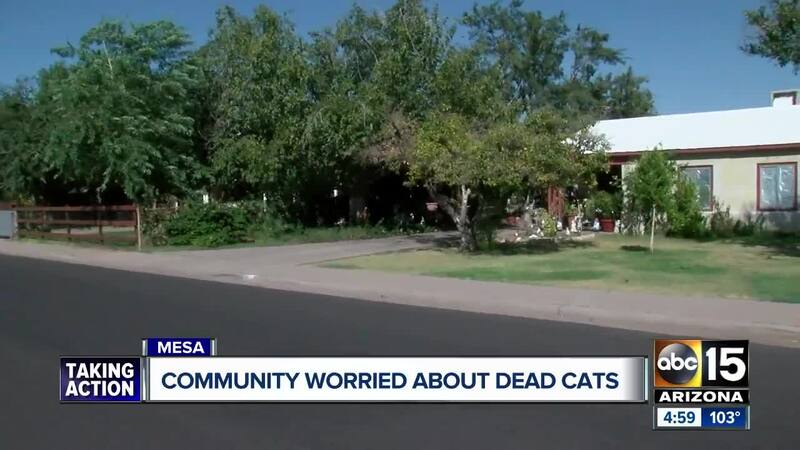 Mesa police say they are now investigating after a series of mutilated cats have turned up in a neighborhood near Grand Avenue and 9th Place. Rosemary Gifford saw two of them while out driving. "I saw a white cat cut in half in the middle of the road, and then a few days later I saw another one. The gray one a little bit further down the road, also cut in half." Another woman posted on social media that she had driven up to three dead cats on Grand, one appeared to have it's head missing. At a previously-scheduled community meeting, police told residents that they would "take a look from our perspective and see if something stands out." Residents previously contacted animal control. In a statement, the city said animal control officers said the cats "appeared to be attacked by wildlife" and said there was no evidence of anything suspicious. The city said there were reports from three people of coyotes in the neighborhood, and other animals, such as hawks or foxes, may also be responsible. Read the full statement from the city below. Residents say despite what the city and animal control officials have said, they're not buying it. "I just don't think it's a coyote. It's too perfectly cut. The cats I saw were perfectly cut in half," said Gifford. Another woman who requested anonymity said she was very concerned. Her father had had three of his cats missing. Two of them returned very sick, one died shortly after returning. "I don't think it's coyotes. I don't think the coyotes are making the cats sick or cutting them," she said. Residents believe there may be something more sinister at play. They believe there may be a person in the community harming animals. 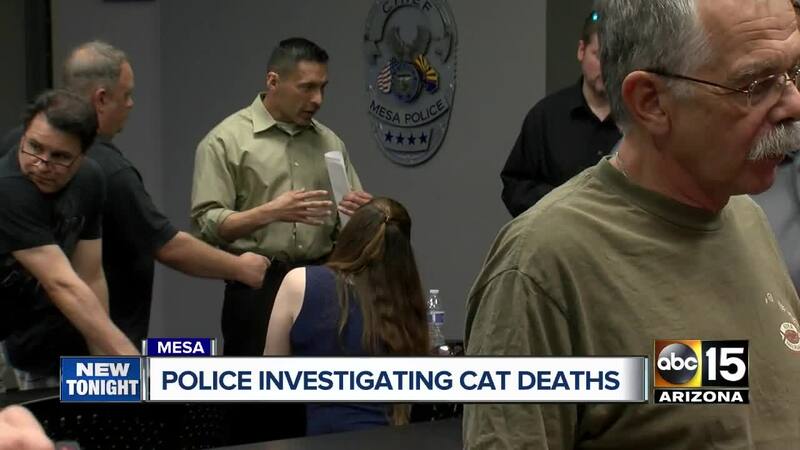 "Both animal control and Mesa police have come to a mutual determination that the 4 deceased cats, all in the same condition, appear to be attacked by wildlife. There is no evidence of anything suspicious. We have information from 3 people who have seen coyotes in the area in the past few weeks. Attached is a photo of a coyote that was on the same street (900 N. Grand) where the first two cats were found dead. It is a small street and the cats were in the middle of the road. The house the coyote is in front of is the same area where those cats were found. Yesterday, an animal control officer went to the area where a deceased cat was found and saw a hawk circling the area, so we now have another type of predator. A Game and Fish representative has also told Mesa Animal Control there have been foxes in the same area."